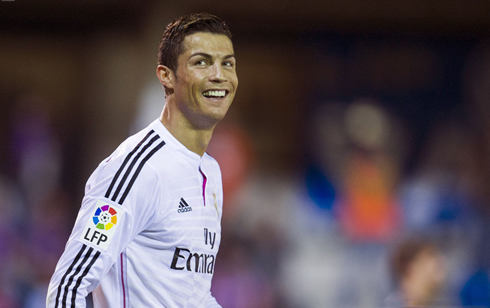 ﻿ Eibar 0-4 Real Madrid. The scoring machine is back! 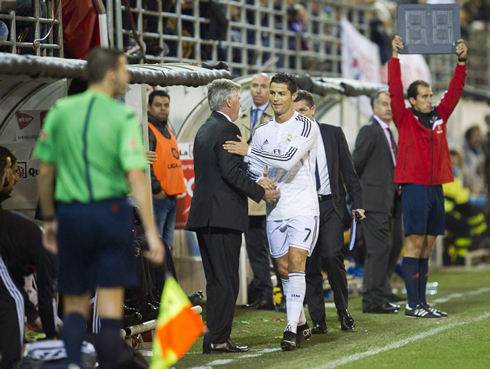 22.11.2014 » Eibar 0-4 Real Madrid. The scoring machine is back! Real Madrid extended their impressive winning streak in La Liga, as they returned from the international break to convincingly win against Eibar by 0-4. Cristiano Ronaldo added another 2 goals to his mesmerizing season, while James Rodríguez and Karim Benzema also scored one goal each. It was the ultimate David vs Goliath battle, as tiny Eibar took on Real Madrid at the tiny Ipurua Municipal Stadium in the Basque Country, with Madrid sweeping their opponents on the night with a 4-0 victory, their 14th on the trot. Though the score line may indicate a blowout, Eibar can leave with their heads held high as they gave the Merengues quite a few scares, but ultimately, the Royal Whites' quality would shine through. The usual suspects were involved in the goals again. Cristiano Ronaldo finished with a brace, taking him to a whopping 20 league goals before the halfway point, while the Colombian James Rodriguez and the Frenchman Karim Benzema completed the scoring. With thousands of fans peering down at the pitch, some of them hanging from trees and peeking from balconies the match certainly had an air of novelty to it. But once on the pitch, Eibar had no intentions of sitting back. They were vibrant and busy, and did well to close down Madrid in the first 10 minutes, as they even managed to garner a few chances of their own. But eventually the deadlock would be broken in the 23rd minute, after a brilliant move from Cristiano Ronaldo. The Portuguese star received the ball on the wing and then basically bamboozled his defender with a delicate chip over the onrushing sliding tackle. His center to a near-offside Benzema was bobbled by the Frenchman, but Ronaldo, never one to give up on a play, reacted brilliantly crossing the ball over to James Rodriguez, who then slotted home a header from inside the six-yard box. Eibar reacted well though, and forced a crucial save from Iker Casillas midway through the first. The Real Madrid captain, who has rediscovered his form and perhaps even more importantly his confidence, pulled off a timely kick save, reminiscent of the one that brought Spain the World Cup four years ago. On the back foot for a bit, Madrid would eventually get their second after a brilliant move involving the ever active Dani Carvajal, Gareth Bale and eventually Cristiano Ronaldo. Great combination play from Carvajal and Bale freed the Spanish right back to cross it to Ronaldo. With no angle at goal, it looked impossible, but CR7 has made a habit of doing just that. With his standing leg planted, Ronaldo reached back and produced a brilliant shot that landed right inside the post and past a helpless Xabi Irueta. Still, Eibar's spirit would not be shaken and they came out in the second half with the same guile and industry that has made them one of the surprise packages in La Liga this season. Pepe was excellent for Madrid at the back as a last line of defense. Every Eibar attacker seemed to come off second best when up against the Portuguese man. The Merengues would make it three in the 69th minute, through some hard work from Marcelo. With the ball heading harmlessly out of play, Eibar defender Eneko Boveda attempted to shield it out, but a tenacious Marcelo rounded him, kept it in play and some quick thinking from James Rodriguez would see the ball at the top of the six yard box as Karim Benzema smashed it into the top corner. It was a hard working goal, mirroring James' first. Real Madrid would add a fourth and Ronaldo his second in the dying moments of the game, when Cristiano's freekick was handled in the box by Raul Albentosa. The call itself may have been harsh, as Albentosa seemed to be covering his face. Still, Cristiano Ronaldo stepped up and buried a brilliant penalty in the goalkeeper's side netting, allowing to break the record for the top scorer ever in La Liga from the penalty spot. It was the first game of the post-Luka Modric era and all eyes were on Isco in the center of the park. Carlo Ancelotti stated repeatedly in the lead up to the game, that he was considering playing the young and increasingly versatile Spaniard there. He had a solid game and was relatively disciplined. Though, it remains to be seen how much Real Madrid will miss Modric's awareness in more challenging fixtures. With Basel on the horizon, it was an ideal game for Madrid today, as they remain at the summit of La Liga. Cristiano Ronaldo next game will be a UEFA Champions League fixture against Basel, scheduled for next Wednesday, the 26th of November. You can watch Juventus live stream, Basel vs Real Madrid, APOEL vs Barcelona, Crystal Palace vs Liverpool, Hull vs Tottenham, and Hamburger vs Werder Bremen, all matches provided from our live soccer streaming game pages.